Give your store the max SEO & content flux boost, by embedding bot crawlable product reviews on product pages. 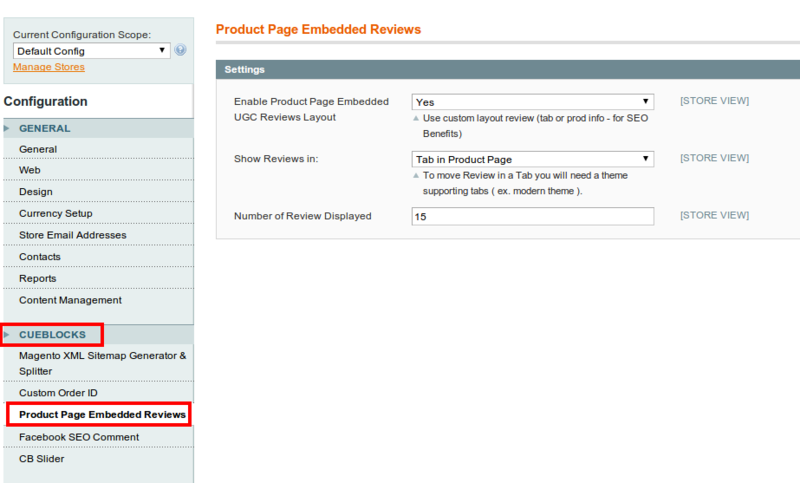 Product reviews, by default, are not embedded in a SEO friendly/bot crawlable fashion on product pages in Magento. This extension achieves that and gives your store the User Generated Content (UGC) content boost. In the current post Google Panda and Penguin world, eCommerce stores require as much User Generated Content (UGC) boost as they can get. The default product reviews functionality of Magento has a problem that it does not get embedded (in a SEO friendly manner and bot crawlable manner) on the product page automatically, thereby not allowing the product page to gain from the SEO benefits of the reviews. No 'iframes' and No 'opening in a different URL'! Get the SEO power and benefits of your hard earned product reviews on your product page itself and give your store the SEO and Content boost. 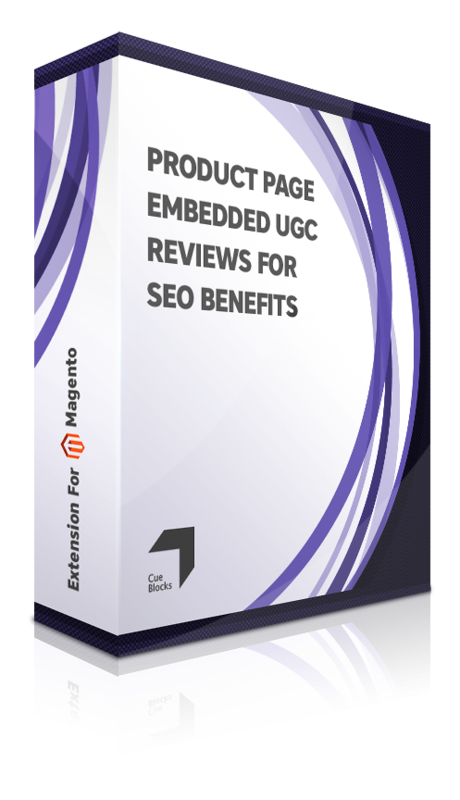 Instead of investing in costly review software which allow this SEO Friendly reviews functionality, use this CueBlocks extension to modify the Magento functionality at a fraction of that cost. 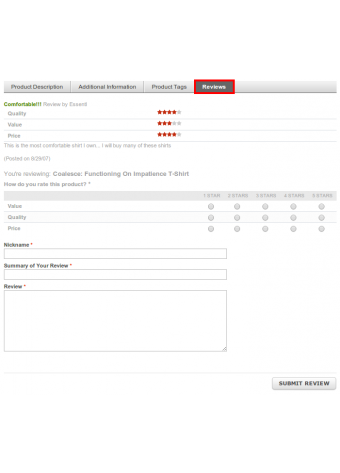 Do you want to display your product reviews on the product page and get the SEO benefits of User Generated Content? 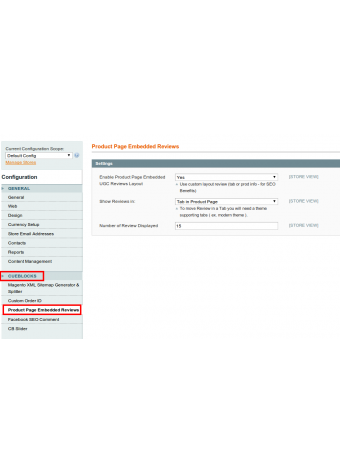 The default Magento architecture doesn't allows you to do so. It is designed to show a link to 'reviews' on your product page, clicking on which a user is taken to a different product review page (/review/). Some code customization is required if you want to display product reviews on the actual product page instead of opening them in a new page. 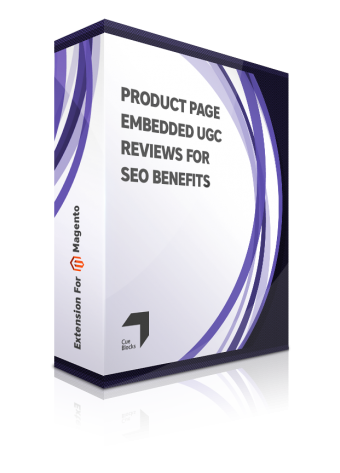 This extension does exactly that - It displays and embeds product reviews on the product page so that you get the maximum SEO advantage. Enable or Disable the reviews on your product page to show up in a 'tab' (if your design supports tabular product page design). 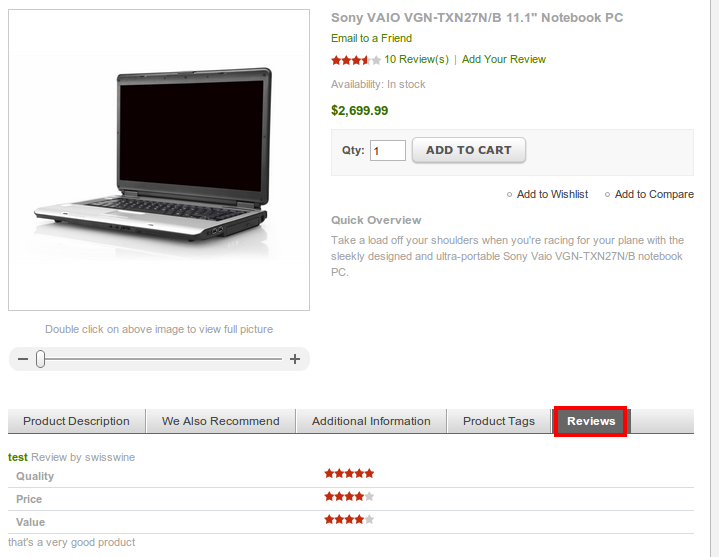 In the absence of a tab on the product page, the SEO friendly reviews will show up towards the end (above the footer). This can be modified by your developer as you like. 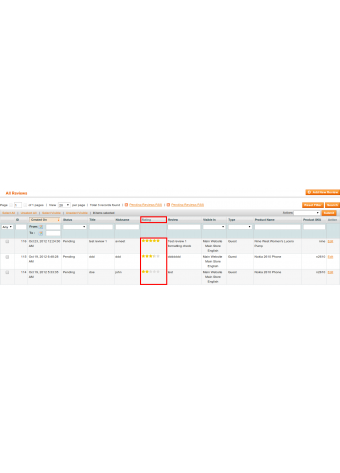 Set the number of reviews that get embedded and displayed on the product page. Why display reviews on the product page? Unique Content & SEO Benefit: Currently the biggest limitation of the default Magento reviews functionality, is that the main product page doesn't get optimum SEO benefit of the reviews left by the user, because this approved user content/review gets published in a different page and not on the Product page itself. 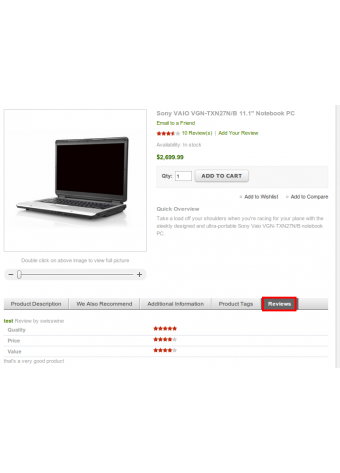 Therefore the keyword relevance of your product page gets diluted. In an ideal case scenario, if user leaves a review, it should be displayed on the product page itself (in a SEO friendly and Search Engine bots crawlable manner!) so that there is continuous, automatic content flux on the product page in the form of user generated content. This keeps the user as well as the Search Engines interested in your product page and you get organic ranking benefits. This technique is widely used by some of the most popular stores and well optimized stores to get more organic traffic for their product pages. Reduce Bounce Rate & Increase Average Time Spent: With a user sending more time on your product page, you automatically increase the average time spent and help reduce the bounce rate. This will positively impact your store's organic rankings. Usability & Conversion Rate Benefit: All your potential visitors like to read product reviews before they make a buying decision. Thus, displaying the product reviews on the product page itself, makes it easier for users to make a buying decision without going back and forth between different pages, and helps improve your store's conversion rate. 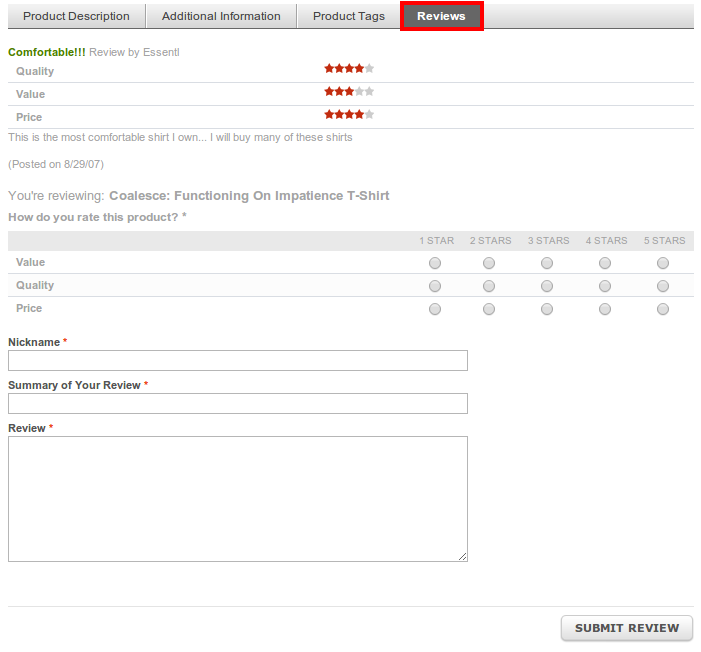 Instead of taking the user away from the product page, you're allowing them to check reviews without leaving the page. This extension has been successfully tested on Magento Community Edition. Please contact us at magento@cueblocks.com if you have any further queries regarding usage of this extension.